Not only do we have regular season football to look forward to in September, now we have a new sports-centered reality show to add to our list of must-see programming. 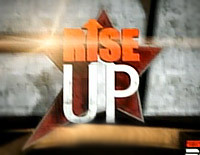 According to the Hollywood Reporter, ESPN has ordered series episodes of last year’s pilot of Rise Up, a show where the network makes over the athletic programs of high schools in need. Rise Up comes at a time when the recession has sapped funding for public education making sports and extracurricular activities particularly vulnerable. ESPN enlists local businesses to donate materials and man-hours so that the renovation project is a community effort. Each hour is bookended by the surprise announcement that the school has been chosen and the final reveal of the shiny new athletic facilities. The concept is nothing new, obviously. Extreme Makeover: Home Edition and NBC’s School Pride are already on the scene, but Rise Up interjects sports and when sports becomes the subject, all of a sudden all is well in the world. Kenny Chesney has been tapped to create the theme song. Somewhere along the way football became closely aligned with country music. The NFL’s theme songs are performed by country music artist. No knock, of course, but for a reality show that will deal with high schools athletics, it seems that Hip Hop music would have been more relatable.